Mullen was born on October 4, 1946, in Los Angeles, the eldest of five children of Mary Jane (Glenn), who worked as an assistant to comedian Jimmy Durante, and Hollywood press agent John Edward "Jack" Mullen. He attended St. Charles Borromeo Church School in North Hollywood , and graduated from Notre Dame High School, Sherman Oaks in 1964. Mullen then attended the United States Naval Academy in Annapolis and was classmates with former Commandant of the Marine Corps Michael Hagee, former Chief of Naval Operations Jay L. Johnson, former Secretary of the Navy and Senator from Virginia Jim Webb, National Security Council staff member during the Iran–Contra affair Oliver North, former Director of National Intelligence Dennis C. Blair, and NASA administrator Charles Bolden. He graduated with a Bachelor of Science degree in 1968. As a junior officer, he served in various leadership positions aboard USS Collett (DD-730), USS Blandy (DD-943), USS Fox (CG-33) and USS Sterett (CG-31). He has commanded three ships: the gasoline tanker USS Noxubee (AOG-56), the guided missile destroyer USS Goldsborough (DDG-20), and the guided missile cruiser USS Yorktown (CG-48); and has also commanded Cruiser-Destroyer Group Two from USS George Washington (CVN-73). Mullen's last command at sea was as Commander, U.S. Second Fleet/Commander, NATO Striking Fleet Atlantic (COMSTRIKFLTLANT). In 1985, Mullen graduated from the U.S. Naval Postgraduate School in Monterey, CA, with a Master of Science degree in Operations Research, and in 1991, he attended the six-week Harvard Business School Advanced Management Program. As Commander, Allied Joint Force Command Naples, Mullen had operational responsibility for NATO missions in the Balkans, Iraq, and the Mediterranean. As Commander, U.S. Naval Forces Europe, he was responsible for providing overall command, operational control, and coordination of U.S. naval forces in the European Command area of responsibility. He assumed these duties on October 8, 2004, and was relieved of them upon his becoming Chief of Naval Operations. On August 3, 2007, the U.S. Senate confirmed Mullen as the Chairman of the Joint Chiefs of Staff. Mullen was sworn in on October 1, 2007. Upon taking office, Mullen became the first naval officer to hold the Chairman's position since Admiral William J. Crowe, who served as Chairman prior to the enactment of the Goldwater-Nichols Act in 1986, and who was the immediate predecessor to Army general and later United States Secretary of State Colin Powell. On February 2, 2010, Mullen and Gates said that they fully supported President Obama's decision to end the "Don't ask, don't tell" policy, which prevented openly gay people from serving in the military. "It is my personal belief that allowing gays and lesbians to serve openly would be the right thing to do," Mullen said at a Senate Armed Services Committee hearing. "No matter how I look at the issue...I cannot escape being troubled by the fact that we have in place a policy which forces young men and women to lie about who they are in order to defend their fellow citizens. For me, it comes down to integrity—theirs as individuals and ours as an institution." Force should be applied in a precise and principled way: Mullen cites the sacrifice involved in deployment as requiring extreme care. Secondly, Mullen argues that "the battlefield isn't necessarily a field anymore. It's in the minds of the people." He cites General McChrystal's restriction of night raids as an example of this principle in action. President Obama nominated General Martin Dempsey as the next chairman of the Joint Chiefs of Staff on Memorial Day 2011. Dempsey had only been sworn in as Army chief of staff the previous month. On September 30, 2011, Mullen officially retired from the military when his term as Chairman ended. In December 2012, one year into his retirement, Mullen was in the news again, for having been the target of computer hacking, a situation that led to subsequent FBI investigations. In 2013, Mullen joined the board of General Motors. On July 11, 2013, Mullen was put on the Board of Directors of Sprint Nextel Corp directly after a buyout from SoftBank, one of Japan's largest cellular companies. In 2016, Mullen joined the Advisory Board of Afiniti, an American unicorn big data and artificial intelligence business. Mullen was vetted by Michael Bloomberg to be his running mate in the 2016 presidential election, but Bloomberg decided against running. In an interview with ABC News on December 31, 2017, Mullen stated his belief that the United States was close to a nuclear war with North Korea. An auditorium was dedicated in his name March 1, 2012, before a graduation ceremony at the Surface Warfare Officers School in Newport, Rhode Island. Mullen is married to Deborah and together they have two sons, John “JMuls” Mullen and Michael Edward Mullen. Both attended the US Naval Academy. ^ a b "The Governor General of Canada > Find a Recipient". gg.ca. ^ The other two Navy officers being Admiral Thomas H. Moorer and Admiral William J. Fallon. ^ Huey-Burns, Caitlin (March 3, 2011). "10 Things You Didn't Know About Mike Mullen". US News & World Report. Retrieved September 22, 2011. ^ "Person Details for Michael Glenn Mullen, 'California Birth Index, 1905–1995'". FamilySearch. ^ "Person Details for John Edward Mullen, 'California, County Marriages, 1850–1952'". FamilySearch. ^ Dowd, Maureen (February 3, 2010). "Defending the Long Gay Line". The New York Times. Retrieved May 12, 2010. ^ The Nineteen Hundred and Sixty Eight Lucky Bag. Annapolis, Maryland: United States Naval Academy. p. 164. ^ "At Ease - Alumni - Harvard Business School". www.alumni.hbs.edu. Retrieved February 2, 2019. ^ "COMMENTARY:We Can't Do It Alone" (PDF). navy.mil. Retrieved February 2, 2019. ^ "Pace leaving as Joint Chiefs chairman". CNN. June 8, 2007. Retrieved June 8, 2007. 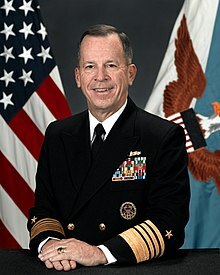 ^ "President Bush Nominates Admiral Michael Mullen and General James Cartwright to Chairman and Vice Chairman of the Joint Chiefs of Staff" (Press release). White House Press Secretary. June 28, 2007. Retrieved July 20, 2007. ^ "Senate confirms Mullen as new military chief". Reuters. August 4, 2007. Retrieved August 4, 2007. ^ "Defense.gov News Article: Gates Recommends New Terms, Positions for Senior Officers". defenselink.mil. ^ "Mullen Confirmed to Second Term as Joint Chiefs Chairman". SENATUS. September 25, 2009. Retrieved September 25, 2009. ^ a b c d e "Nominee Mullen: Little political progress in Iraq". USA Today. August 1, 2007. Retrieved August 4, 2007. ^ Mullen, Mike. Landon Lecture Series Remarks Archived March 10, 2010, at the Wayback Machine, March 3, 2010, Kansas State University. ^ "Former Joint Chiefs chair Mullen joins GM board". Army Times. Associated Press. January 31, 2013. Retrieved February 8, 2013. ^ "Sprint and SoftBank Announce Completion of Merger". Sprint.com. July 10, 2013. Retrieved October 7, 2013. ^ "Princess Beatrice wins her first high-profile client as a business matchmaker". The Telegraph. Retrieved May 29, 2017. ^ "Michael Bloomberg Says He Won't Run for President". The New York Times. March 7, 2016. Retrieved March 7, 2016. ^ News, A. B. C. (December 31, 2017). "US closer than ever to 'nuclear war with North Korea': Former Joint Chiefs head". ABC News. Retrieved February 2, 2019. ^ a b c d e f g "Statement of Senator John Warner" (PDF). Nominations of Adm. Michael G. Mullen, USN, for reappointment to the grade of Admiral and to be Chairman of the Joint Chiefs of Staff; and Gen. James E. Cartwright, USMC, for reappointment to the grade of General and to be Vice Chairman of the Joint Chiefs of Staff. Committee on Armed Services, US Senate. July 31, 2007. pp. 903–905. Retrieved June 11, 2011. ^ "MULLEN, Michael Glenn AO". It's an Honour. Commonwealth of Australia. November 5, 2010. ^ "Chairman of the Joint Chiefs of Staff Admiral Mike Mullen Received the German Federal Cross of Merit". Archive of Selected Past Events. U.S. Department of State – Diplomatic Mission to Germany. June 9, 2011. Archived from the original on November 5, 2015. Retrieved June 11, 2011. ^ "Soldier On". Wesoldieron.org. Archived from the original on May 14, 2012. Retrieved May 25, 2012. ^ "Admiral Michael Mullen USN appointed Honorary Officer in the Order of Australia". November 7, 2010. Archived from the original on July 9, 2013. Retrieved August 12, 2013. ^ Navy Times (March 7, 2012). "Mullen honored at SWO School". Gannett Government Media Corp. Retrieved April 27, 2012. "Michael Mullen collected news and commentary". The New York Times. "Joint Chiefs Nominee Had Hollywood Upbringing (on Mullen's parents)". Day to Day (audio). NPR. July 30, 2007. Mulrine, Anna (April 18, 2008). "Admiral Michael Mullen: A Navy Man Looks Out For The Army". U.S. News and World Report.